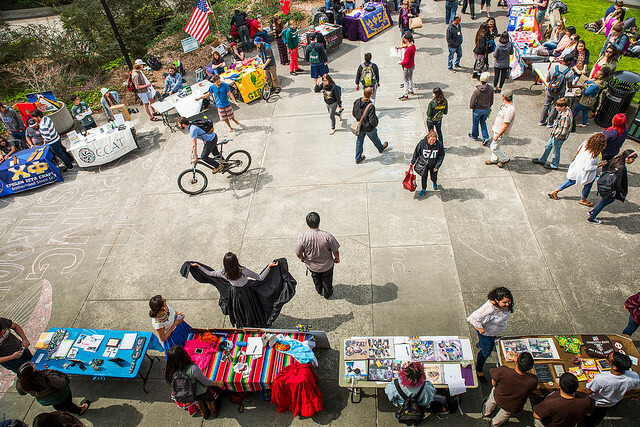 Hundreds of prospective students, family members, and guests are coming to campus for Humboldt State’s open house, Spring Preview, on Friday, March 24 and Friday, April 7. The annual event gives applicants, newly admitted students (freshman and transfer), and their families a sneak peek at life inside and outside the classroom at HSU. It’s also a chance to experience HSU through the eyes of current students like English major Sydney Hubbel. The student intern for Orientation and New Student Programs, Hubbel has worked at Spring Preview the last three years. “I attended an HSU Spring Preview in high school because it was cool and interesting to get to know HSU from a student’s point of view. None of the other schools I had been considering did something like this,” says Hubbel. Events include tours of campus and residence halls, plus chances to talk with faculty from every department at the Majors Fair and to learn about clubs and extracurricular activities. The College of Natural Resources & Sciences; College of Arts, Humanities, & Social Sciences; and the College of Professional Studies plan to host open houses, as well. Workshops will cover everything from affording college to resources that are available from the Cultural Centers for Academic Excellence. Spanish translation services will be available for some sessions. Check the schedule for details on which workshops will be in Spanish. The last day to sign up for Spring Preview is March 17. To see the full schedule, go to humboldt.edu/springpreview. Contact hsupreview@humboldt.edu or (707) 826-3510 for more details.